Since 1996, JR Rehab Services has established itself as one of the premiere health and rehabilitation service providers in British Columbia. We guide each person to optimize their health and wellness, and overcome illness or injuries so that they can resume productive and active lives. 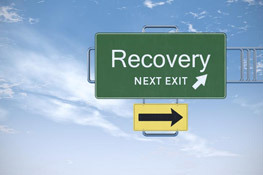 Learn more about JR Rehab Services. Spaces available in our next class! 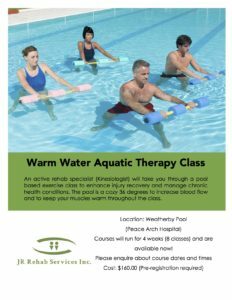 JR Rehab is currently providing warm aquatic classes at the Weatherby Pool in Peace Arch Hospital. The class consists of a combination of strength, stretch and cardio exercises modified specifically for the participants based on their skills level and ability. To request the services of one of JR Rehab’s Occupational Therapists, Physiotherapists or Kinesiologists, please complete the short, 4 step referral form. Once reviewed, you will be contacted shortly. Thank you and we look forward to assisting you!